Keith Elder and Chris Woodruff were nice enough to have me on their excellent and very popular webcast Deep Fried Bites last month, and the episode is up and ready! We discuss the security environment for web developers today, focused on the OWASP Top 10 and testing your web app. I had a good time on the show, and it turned out really well, I think. Hope you'll take a listen! Some of you may have read my dual boot setup post when Dev Preview (DP) came out. Now it is time to upgrade that rig to Consumer Preview (CP), and I through I would give an update. The bootable USB drive I used for DP got repurposed for CP, so the laptop got booted from that. I decided to format the partition that I had used to set up dev preview, and do a fresh install of Consumer Preview. The disk tools look unchanged (since Vista, actually) and that went painlessly. So far so good. Interesting that the license key management has been installed, anthough it is freely avainatable. The English key is DNJXJ-7XBW8-2378T-X22TX-BKG7J. Other than that the installation was the same as DP. The install took about 6 minutes on my Intel i7. If you are using a bootable USB note that Windows won't warn you before reboot. It will go right back into the setup routine when it is finished installing. You can just turn the machine off, unplug the USB drive, and turn the machine back on to continue installation. The best news was that is honored my dual boot that DP set up! I was happy about that. There are backups, and honestly I pretty much live in Windows 8 now, but it is nice to know my Windows 7 partition is still there if I need it. It should be noted that my display driver wasn't recognized. I downloaded the NVidia display driver from Acer's site and installed it. After a reboot, I was in business - awesomesauce. 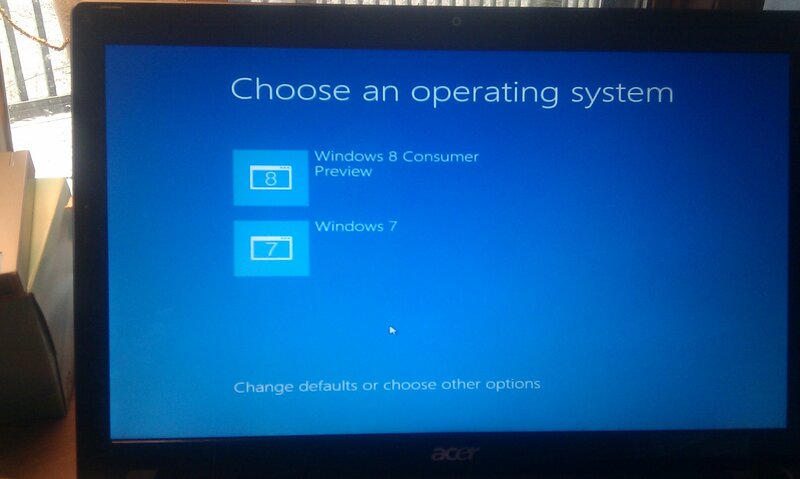 Oh, and another thing: I installed Windows 8 CP on my Asus slate Wednesday with zero problems also. It isn't a dual boot though so I didn't think it was worth a blog post. This one is a little neater. Hope everyone is enjoying Windows 8! Now go build some apps!! In the related JS file, add an event handler for the button. This collects the required values for the OAuth call and then calls Windows.Security.Authentication.Web.WebAuthenticationBroker.authenticateAsync, where all the magic happens. The scope parameter in the querystring is how you get extended permissions. The promise has callbacks for completion and error. You can swallow the error, but on completion, make sure to keep the token.